An increasing number of Muslim women in Kerala cutting across class and age barriers are wearing the burqa. In earlier times, Muslim women used to sport just a scarf. Thiruvananthapuram, May 16 (IANS) — N.A. Karim, a former pro-vice chancellor of Kerala University and a known progressive, said the trend seemed to be spreading among Muslim women in the state. “It could be partly psychological, partly religious and may even be a fashion statement or a tendency to imitate,” Karim told IANS. He said the move by several Western countries to ban religious symbols might have led to this trend. “When such a thing happens, mass or group psychology comes into play and it may have worked in this case too,” said Karim. Contrary to earlier times when Muslim women used to sport just a scarf, today an increasing number of them are wearing burqas. In shopping malls throughout the state, there are exclusive shops selling burqas. Muslims constitute about 24 percent of Kerala’s population of 32 million. Opposition legislator Mac Ali, who hails from the Muslim dominated Malappuram district, attributed the development to the strong links over the last four decades between Kerala and the Middle East, which has a large number of Indian expatriates. 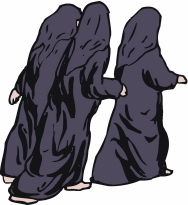 While earlier just the simple, traditional black gowns were available, a variety of burqas are now available in different colours and with embroidery. Muslim clerics, however, welcome the change as one that could strengthen Islam. “The religious leaders conducted a study and found that many women liked the idea. Moreover, Islam is very clear in the dress code for women,” said Hamza Moulavi, the Imam of the Palayam mosque. Moulavi admitted that the religious dress code had not been fully accepted by the younger generation of Muslim women but said the concept that the dress code would do more good than harm has really been welcomed. “I regularly mention this in my discourses. Another welcome change is that even the educated and employed Muslim women are making the dress code a habit. Kamala Surayya is the best example of this,” said Moulavi referring to author Kamala Das who converted to Islam and has taken to wearing the burqa.